After a delayed release and initial problems, Blu-ray has come close to HD DVD in terms of picture quality. Other manufacturers' first-generation Blu-ray players are coming out now, including the Panasonic DMP-BD10, the Sony BDP-S1, the Pioneer BDP-HD1, and the Philips BDP9000 reviewed here, which has the least buzz of the bunch. 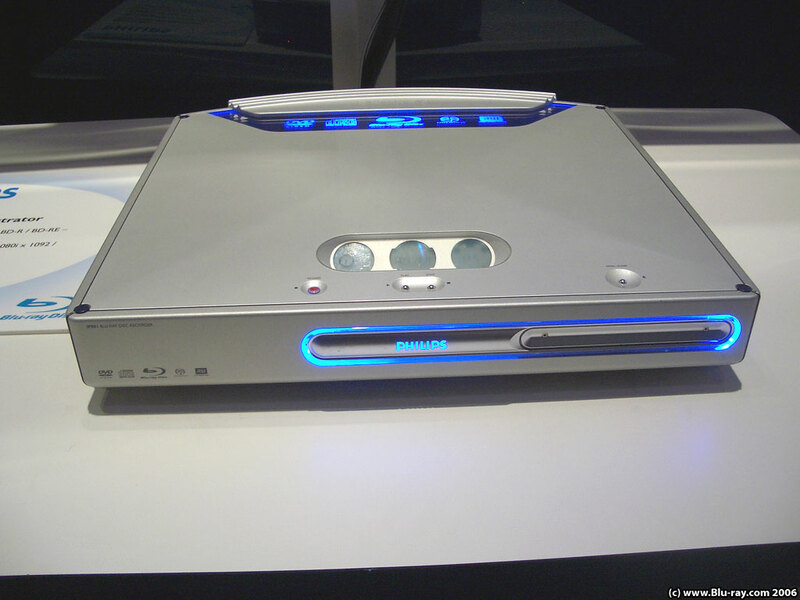 Despite its relatively unknown status, the Philips performed on par with the other players we've tested recently, and exhibited its own attractive qualities, namely an excellent external design and remote and very good performance when upscaling standard-definition DVDs. It's also no slouch in terms of Blu-ray picture quality, delivering just as pretty a picture as we saw with other players we've reviewed, namely the Samsung, the Panasonic, and the Sony PlayStation 3. The big disappointment with this player is that it has limited audio capabilities for standard-definition DVDs, as well as what seems to be bare-bones support for audio on Blu-ray discs (see Editor's note below). For nonaudiophiles who are content with missing lossless soundtracks like Dolby TrueHD and DTS-HD Master, this might not be a problem. Though we really liked many aspects of the BDP9000, it's still hard to give it our full recommendation. Like all non-PS3 Blu-ray players currently available, the BDP9000 lacks HDMI 1.3 compatibility--and in just a few short weeks at CES, it's likely that several HDMI 1.3 players will be announced, potentially at lower prices. This issue leads us to our primary beef with the Philips and all current Blu-ray players: price. You can currently get the very capable PS3 for considerably less than $1,000 on eBay, and over the next few months, it will be available for even less. Despite its appeal, the Philips BDP9000's price makes it tough to recommend for anyone except the most dedicated home theater enthusiasts. And we're betting that those enthusiasts will opt for a Blu-ray player that has more extensive audio capabilities for both DVDs and Blu-ray discs. Editor's note: At the time of this review, we were unable to confirm with Philips representatives precisely what high-resolution soundtrack audio capabilities the BDP9000 has. We will update our review as soon as we know more, but we suspect that the player cannot handle the new lossless formats at all (see below). We gave the Philips BDP9000 the highest design score of any next-generation player we've reviewed so far. Like most Philips products, its silver chassis and a black front panel combine for an unusually stylish look. The front panel is glossy and is marked by only two buttons: power and disc open/close. Left of center is the disc drawer, which emanates a blue light, and to the right is an LCD screen which is a little on the small side. The bottom section is angled inward, similar to the design of the Samsung BD-P1000, and flips down to reveal two media card readers and some additional front panel buttons, including a video output selector button and handy chapter forward/backward buttons for when the remote goes missing. 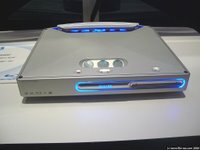 Really our only complaint about the design is that the aforementioned blue light around the disc drive and the blue light next to the power button cannot be dimmed. Although there is an option to set the front display to "dim" in the settings menu, this only dims the LCD screen. The remote for the BDP9000 is probably the best remote we've seen packaged with a high-definition disc player. It largely resembles the Philips TV remotes--which we're not huge fans of--but this one gets a lot right. At the very top is an illuminated strip of device names, and you select which device you want the remote to control by scrolling through them with the Select button. The directional pad is easy to use with the appropriate buttons littered around it. There are convenient rocker buttons to control TV channels and volume, and the play, chapter skip, and fast forward/backward buttons are logically located. We also like the way the remote felt in our hand; it has some weight to it and feels solid, and the buttons give a slight snap to reinforce presses. Sure, it doesn't have backlighting, but given some of the truly awful remote designs we've seen from early Blu-ray and HD DVD players, we were really pleased with it. Another nice design feature about the BDP9000 is its high-resolution menu graphics. It's certainly not a major feature, but the white and blue color scheme, along with the smoothly rendered text, is easy on the eyes and way ahead of the blocky graphics on the Panasonic DMP-BD10. Aesthetics aside, the menu is generally easy to maneuver, and we had no problems adjusting the output resolution or dimming the display. The Philips BDP9000's main feature is the ability to play Blu-ray discs. It can also play and upscale regular DVDs to 480p, 720p, 1,080i and 1,080p resolutions. Upscaling won't make your regular DVDs look like high-definition discs, but it might make them look a little better if the video processing in your HDTV is worse than the processing of the BDP9000. For Blu-ray soundtrack support, the DMP-BD10 handles Dolby Digital and DTS, and can send those soundtracks over HDMI in either bitstream--to be decoded by an A/V receiver--or linear PCM (LPCM) format. What's disappointing is that apparently the BDP9000 does not have any support for the new higher-resolution soundtrack formats, such as Dolby Digital Plus, Dolby TrueHD, DTS-HD High Resolution and DTS-HD Master. We have contacted a Philips representative to confirm the audio capabilities of the BDP9000 and will update that this review as soon as we have more information, but we suspect it simply cannot handle these new formats. The BDP9000's soundtrack capabilities for standard DVDs are surprisingly weak. It can send Dolby Digital and DTS soundtracks via a digital connection (HDMI, optical and coaxial), but that's about it. Since it lacks a full-function onboard decoder for either of these formats, people who connect only the Philips' analog audio outputs won't get the full surround experience from DVDs. If they select a disc's Dolby Digital soundtrack they'll get just stereo from the front two channels, and if they select DTS they'll get silence. In addition, via HDMI in PCM format, the BDP9000 is again limited to stereo for Dolby Digital and silence for DTS. If all that sounds like a foreign language don't worry; the Philips can deliver the full capabilities both types of DVD soundtracks as long as you make a digital connection to an audio component that has Dolby Digital and DTS decoding. Anyone comparing first-generation Blu-ray players should note that the Panasonic DMP-BD10, for its part, had no problem handling these DVD soundtracks in either bitstream or PCM mode. Unlike some other Blu-ray players, the BDP9000 does not support either of the high-resolution audio formats, DVD-Audio and SACD. If you don't already have a collection of these discs you probably won't consider this a big loss. Connectivity on the BDP9000 is standard compared to other Blu-ray players. The most important connection is the HDMI output, which is capable of carrying both 1,080p high-definition signals and multichannel audio. Philips also includes an HDMI cable with the BDP9000, which is a nice touch. The rest of the video connectivity is rounded out by a component-video output and an A/V output with S-Video. While the component video output on current Blu-ray and HD DVD players can output Blu-ray movies at high-definition resolutions such as 720p, 1,080i, and 1,080p, it is possible that in the future movie studios will restrict the component-video output resolution of certain movies. For audio connections, the BDP9000 can use the aforementioned HDMI output, as well as optical and coaxial digital audio outputs, 5.1 multichannel analog outputs, and standard stereo analog outputs. As we mentioned before, the front of the unit has two media card slots that the manual says can handle CompactFlash (type I), Microdrive, SmartMedia, Memory Stick Pro, Multimedia and Secure Digital memory cards, as well as Memory Stick Duo, Reduced Size Multimedia and Mini Secure Digital memory cards with appropriate adapters. To test Blu-ray image performance, we put the Philips BDP9000 up against several other players we had on hand: the Panasonic DMP-BD10, the Samsung BD-P1000, and the Sony PlayStation 3. We spent several hours watching footage on these players and the verdict was clear: all the players we looked at offered extremely similar image quality. We looked at these players on the Pioneer Elite Pro-FHD1 and the Sony KDS-R60XBR2 at 1,080p over HDMI using our Gefen HDMI switch/distribution amplifier, and started off by watching Aeon Flux, one of the better Blu-ray releases in terms of picture quality. Despite there being tons of very detailed scenes, we found the players to be nearly equally sharp. Every time we thought we noticed a difference, we'd watch it on the other player and noticed that it was there too. Even when we thought we'd be able to notice some differences--such as the thin vertical lines on Chapter 9--we wound up feeling like none of the players had an edge. We decided to move on to the Mission: Impossible III disc and found more of the same. In all our viewing, our gut instinct is that perhaps the Panasonic DMP-BD10 had a slight edge on the Philips BD9000 in terms of sharpness--but the difference is so slight that we wouldn't trust ourselves to be able to tell them apart in a blind test. We did notice some video artifacts in the movie, particularly where Philip Seymour Hoffman walks through the party there is some slight judder, and we could also see some jaggies in the background. However, these issues were present in all of the players, so either they are present in the source or none of the current Blu-ray players could handle them properly. We also took a quick look at the test patterns hidden on Sony Blu-ray releases--which can be accessed by pressing 7669 (S-O-N-Y) and then Enter from the main menu screen. Switching between the resolution pattern on the Philips BD9000 and the Panasonic DMP-BD10, they looked extremely similar--which wasn't surprising considering what we saw in actual program material. The Philips, and indeed none of the Blu-ray players we've tested so far, cannot output 1,080p at 24 frames per second (1,080p/24); they all use the standard 1,080p/60 frame rate. Since few displays can handle 1,080p/24 this isn't a big issue. On the few displays that can, however, the 1,080p/24 capabilities of the other two Blu-ray players--Sony's BDP-S1 and Pioneer's BDP-HD1--might lead to a slight picture-quality improvement. We don't know yet because we haven't tested them. As most people will have more DVDs than Blu-ray discs for quite some time, we consider the DVD upscaling performance of a player to be very important. We started off by looking at Silicon Optix's HQV (Hollywood Quality Video) test suite in 1,080p, 1,080i, 720p and 480p resolutions. For the most part the BDP9000 was very good--the first pattern demonstrated it successfully passed the full resolution of DVDs without a problem, and this was backed up by another test with marble stairs and a bridge that looked very detailed for DVD. It also didn't have any problem with scrolling titles--like those you'd see on CNN--or a 2:3 pulldown test with a racecar, where its processing kicked in after about a second. We did notice some issues on other tests however, albeit nothing particularly egregious. For example, a test with a rotating line looked mostly good, although when an additional graphic popped up on the screen, it suffered from bad jaggies and made the line go haywire. We also noticed that the processing was a little slow to kick in on some tests--such as a test with three shifting lines--which is a little worse than the Panasonic DMP-BD10. On the other hand, we also looked at the Windows DVD test annex and the BD9000 had no issues with the chroma upsampling error--a problem we noticed on the DMP-BD10. While looking at test patterns is a good way to spot problems, the real test is looking at actual program material. We started with our favorite 2:3 pulldown torture test, Star Trek: Insurrection, and the BDP9000 handled it admirably. The curved lines on the bridge and boat hulls were rendered smoothly, and although there was a little judder as the camera panned across the village, we see this on almost every DVD player. We also took a look at the opening of Seabiscuit, which often gives lesser DVDs problems. Despite some of the minor video processing issues we noticed in HQV, the BDP9000 handled the opening of black and white photos very well, with almost no jaggies. Overall, the BDP9000 is a very good upscaling DVD player and we imagine only the most ardent videophiles would find much to complain about. A lot of the complaints about first generation high-definition disc players have been regarding their slow load times--the notoriously slow Toshiba HD-A1 could take over a minute to load a disc. The Philips BDP9000 is decidedly quicker, loading most discs in close to 22 seconds. We also felt the BDP9000 was just at tad faster than the Panasonic DMP-BD10 in skipping around chapters--although this doesn't matter much if you usually watch a movie straight through. Of course, none of the standard Blu-ray players can match the speed of the PS3; its chapter skips are nearly instantaneous, and it has the fastest load times we've tested yet.